Printer ink cartridges are used by people extensively these days to print out their work and data. What many people do is throw away their old cartridge once the ink is over and purchase a new one every time. They forget to think about the negative impact such a disposal has on the environment, especially because these items are not biodegradable. The best way to reduce such a negative environmental impact is to recycle the printer ink cartridges. Many cartridges available these days, for example, Canon cartridges and HP deskjet cartridges are all refillable. So is the case with many laser toner cartridges. Refillable means that the cartridge can be taken out of the printer and filled with fresh ink. The ink can be refilled either by the service center of the printer or by a store that sells printer inks or by oneself. To fill the ink in the cartridge oneself, it is essential to learn how to do the filling. A person from the printer store or service center can show you how to go about it. It is also essential to have a jar of the inks available in the office for the refilling. Other than refilling cartridges are also recycled. This means that “new” cartridges are made out of the old cartridges’ parts. Sometimes the entire cartridge itself is repaired. For rebuilding a “new” cartridge from the parts of an old one, each and every part of the cartridge is checked for damages. The usable parts are then cleaned and repairs done where necessary. They are then combined from parts from other cartridges to make the “new” one. Some remodelers use new parts in place of some components. The cost of this cartridge is much lower than a new one and also there is less components being thrown into the environment. 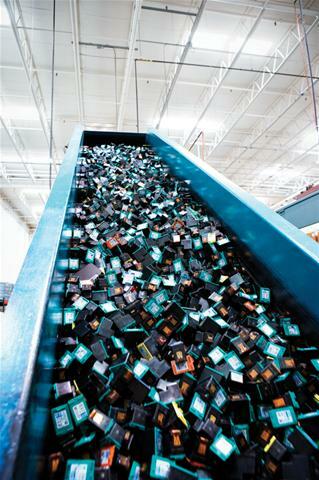 The ideal place to go to recycle printer ink cartridges is a recycle shop for printers. There are many available these days and some even have websites for the same. There are many online shops that sell new and old recycled cartridges. These cartridges are available at very reasonable prices. The first and foremost advantage of recycling printer ink cartridges is that it reduces pollution. This is because the cartridges are not dumped into the environment where it stays as a non-degradable waste. They are reused again and again. Recycling helps reduce the expenses of the firm as the same material is used again and again. This includes refilling the empty cartridges and buying recycled cartridges. Many people make it a hobby to recycle old cartridges that others throw out. This way they can make some money out of doing something good for the environment. Refilling and recycling old printer ink cartridges is the right way to go if a firm is planning to go green and try and reduce their carbon footprints. Many people are therefore turning to recycling to increase their contribution to protecting the environment.